6th September 1766, Eaglesfield, Cumbria, England. John Dalton was the third of six children of a poor handloom weaver, Joseph Dalton who was a strict Quaker. Taught at a Quaker School by Elihu Robinson. 1785: Dalton became principal teacher of the Quaker School in Kendal, Cumbria. 1787: He began a series of meteorological observations. 1793: He became Tutor in Natural Philosophy at the Manchester Academy (a Presbyterian college). Wrote “Meteorological Observations and Essays” which attracted little attention. 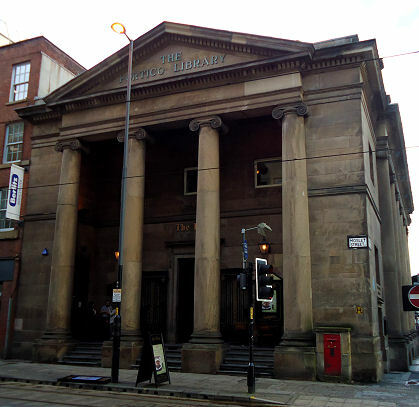 1794: Dalton joined the Manchester Literary and Philosophical Society. Presented a paper to the Manchester Literary and Philosophical society on Colour Blindness, an affliction from which he suffered. This earliest description became known as Daltonism. 1799: He earned his living as a private tutor to give him more time to spend on his private scientific interests. The Manchester Literary and Scientific Society purchased a house at 36 George Street, Manchester where Dalton was allowed to live and work. (The house and many of the Society’s records were destroyed in 1940 during the Blitz). 1803: Dalton first advanced his idea of atomic theory, which was based upon his study of the physical properties of atmospheric gases. Discovered the law of partial pressures of mixed gases which became known as Dalton’s Law. 1804: He delivered a series of courses at the Royal Institution, in London. 1819: Dalton became President of the Manchester Literary and Scientific Society. 1826: Awarded the Gold Medal of the Royal Society. 1830: He became one of the eight Foreign Associates of the French Academy of Sciences. 1833: Dalton was granted a Civil Pension of £150 per year, which left him able to devote more time to his studies. He was also in a position now to help with the building of the Mount Street Meeting House in Manchester. 1793: “Meteorological Observations and Essays”. 1808: “New System of Chemical Philosophy”. 27th July 1844, Manchester, England. Mount Street Meeting House, Manchester. Friends Meeting House, 6 Mount Street, Manchester, M2 5NS.